Leonard Stowe was born on 11 March, 1837, in Trolly Hall, a large town house, still preserved in Buckingham, Aylesbury Vale District, South East England. He was the son of William Stowe (1791-1860), surgeon at Buckingham, and his wife, Mary. His eldest brother, William Henry Stowe (1825–1855), was an English scholar and journalist. Leonard Stowe attended a school at Iffley, near Oxford, and later (1853-1856) studied at the celebrated Rugby School in Warwick-shire (one of the oldest independent schools in Britain), when Dr Meyrick Goulburn was headmaster. On 2 September 1858, Leonard Stowe went aboard the ship (barque) Lady Alice, traveling from Gravesend, near London, to Nelson (a town on the eastern shores of Tasman Bay, in the South Island), New Zealand. In 19th century the voyage from England to New Zealand takes a lot of time (more then 4 months), so the ship arrived in Nelson on 14 January, 1859. In Nelson, Stowe had some years' experience of station life under Arthur Penrose Seymour, a run-holder from the Awatere district. In 1863 Stowe was appointed secretary to Thomas Carter, third Superintendent of the province of Marlborough, and from 1864 Stowe acted under Seymour, when he was raised to the fourth Superintendent of the province of Marlborough. In 1865 Stowe became Clerk of the Legislative Council, a position which he occupied for more than 20 years. In 1889 he was appointed as a Clerk of the Parliaments. Stowe has filled many other offices during his career (see the nearby photo from 1902), and he was a notable figure in the Parliamentary life of New Zealand for over 30 years. He was also a headmaster of Nelson College for several years. Leonard Stowe's first wife, Mary Jane, died on 26 March 1868, aged only 30. 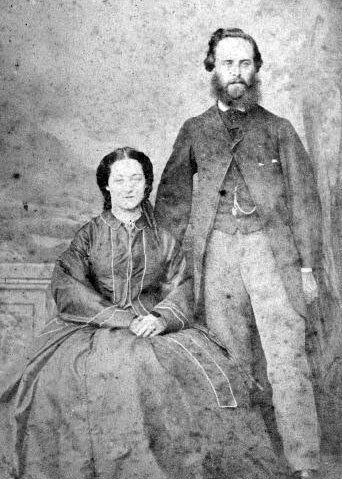 Three years later, on May 31, 1871, he married in Nelson, New Zealand, to Jane Greenwood (1838-1931), an artist. In Nelson Danforth was working as a doctor, farmer, magistrate, Captain (of the Nelson Militia), Clergyman and Flax Agent. 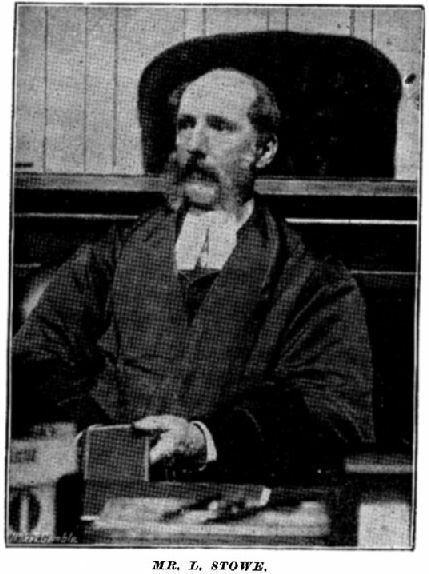 Later in his life he took a few public positions, like a member of the Legislative Council, Inspector of Schools, Principal of Nelson College, and Sergeant of Arms to the House of Representatives in Wellington. Sarah Danforth was a keen artist and letter writer, and took to the new job of housekeeping with gusto, and later between 1865 and 1868 she ran a successful school with six of their daughters (they had 12 children). 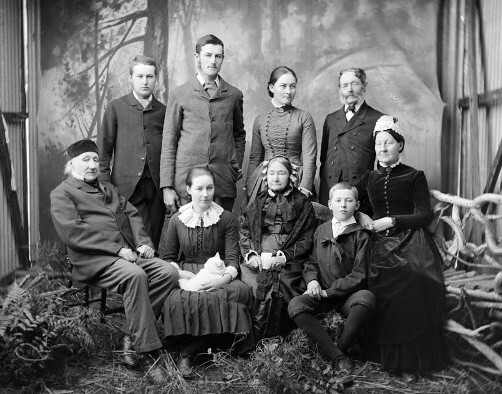 Dr John Danforth Greenwood (far left) and his wife Sarah Fields-Greenwood (far right), with family members in between (a photo from early 1850s). The girl with the cat in the first row is probably the young Jane Greenwood. Leonard and Jane Stowe had 5 children: 3 sons— William Reginald (9 Mar 1872–9 Feb 1949 ), Harry, and Leonard Acland (11 Aug 1876–7 Nov 1876), and 2 daughters—Emily Muriel (10 Apr 1875–28 May 1971), and Mary Sylvia (28 Jul 1873–20 May 1927). Jane Stowe was a delightful watercolorist and used to exhibit her paintings at the New Zealand Academy of Fine Arts since 1883 until 1931. She received many prizes and honorable mentions. Leonard and Jane Stowe lived in a nice wooden house called Te Moana (later known as Tiakiwai) at 2 Tinakori Road, Wellington (see the lower photo from 1880s). 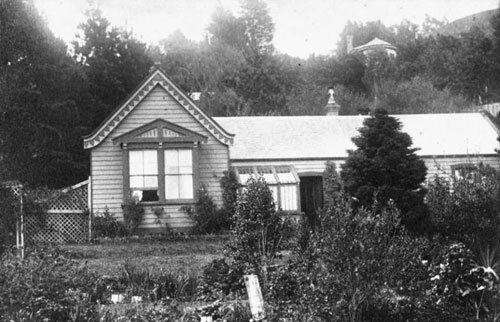 The house Te Moana (later known as Tiakiwai) at 2 Tinakori Road, Wellington, owned by Leonard and Jane Stowe. Leonard Stowe was the inventor of Stowe's Patent Calculating Machine, which was exhibited at the Melbourne International Exhibition of 1881, and received honorable mention. Leonard Stowe died 83 years of age on 25 April, 1920, and was buried in Bolton Street Cemetery, Wellington. His wife Jane died of bronchitis in Wellington on 5 November 1931, aged 93.